The question is obviously limited to the ethical but may also be considered in the area of morals and thus revise it to, “Is euthanasia morally correct? I do not intend to get into a hair-splitting discussion since, in a lot of instances, ethics and morality are used interchangeably. However, to look at the matter more closely, there is actually a significant difference between these two concepts. In terms of what is considered ethical, there is not only a single universal ethics. Ethics constitutes a body of rules in a particular field of concern like business, medicine, sports, pedagogy, and religion among others. Each of these fields has a set of principles or codes of conduct formulated, agreed upon, and instituted by people that are officially considered members of a field of concern. In this sense, no outsider can ever have a say or influence by way of an agreement or rejection on whatever the ethics of a particular field states and promulgates. Meanwhile, morality depends on an individual human being’s personal principles as to what s/he thinks is good or bad, right or wrong, for her/himself. With this in mind, it is the individual who establishes his own morals with the caveat that in so doing, s/he doesn’t step on other people’s toes, so to speak. Morality is therefore basically subjective compared to ethics which is fundamentally objectified by consensus and hence could finally be rendered truly objective within the confines of a specific domain among many. However, the dialectical connection between ethics and morality traverses the trajectory where the common morals of a group of like-minded people provide the ground to formulate ethical codes and principles, i.e., rules of behavior, within their shared context. Moreover, the latter condition can most likely influence the personal morals of an individual without necessarily getting into the same context. 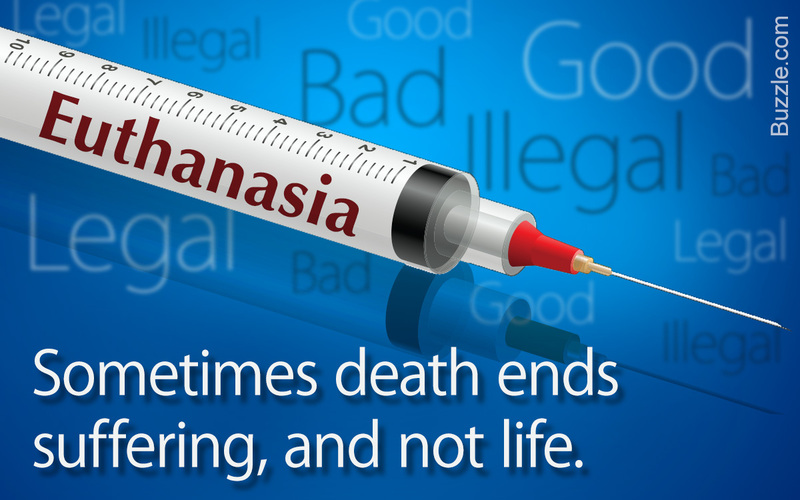 “Euthanasia” is the Greek for “good death” (“eu” which is the Greek for “good” or “well” and “thanatos” which is the Greek for “death”). The etymological essence projects a positive signification that departs from the dysphoria of death. In other words, there is nothing morbid in euthanasia. It categorically entails a way of looking at death as something desired or wished for, with a sense of gladness. In fact, its theoretical character could even be translated as a celebration of death. Taking it at its face value, there is nothing wrong in euthanasia, anyway all of us alive now will ultimately get to that point of time when “the crossing over” is definite, i.e., inevitable. As we experience life around, we have seen deaths of people and the circumstances surrounding them. On one hand, there is a death that is calm and quiet, tranquil and blissful. But on the other, there is a death that is agonizing and painful, violent and excruciating. If death could be decided on–and surely it could be–then who wouldn’t opt to have it in serenity and quiet, in tranquility and stillness? If such kind of death is possible through euthanasia, why can’t one avail of it when her/his condition in life is one of suffering in anguish and pain while being tormented and tortured by an incurable affliction? Zeroing closely into the technicalities of euthanasia, it has two fundamental varieties: voluntary and non-voluntary. The present discussion is specifically focused on the voluntary variety, though, the non-voluntary kind may merit some reasonable attention if such is administered with the full consent of the patient’s close relatives. Meanwhile, voluntary euthanasia has the absolute consent of a conscious and rational human being who has decided once for all to end his life due to immeasurable suffering caused by an incurable infirmity. This death procedure, if you will, is performed professionally by medical practitioners assigned by a legitimate medical institution–a hospital or medical center, for that matter. This makes voluntary euthanasia a methodology wherein a qualified medical practitioner assists the termination of a human being’s life on the basis of the latter’s conscious decision. “Assisted death” is how euthanasia is dubbed. Furthermore, euthanasia–voluntary or non-voluntary–may either be active or passive. Active euthanasia involves the introduction of lethal substances into the physical system of a person to enhance death. Passive euthanasia is a condition wherein all life-giving support systems and medically-administered treatments for the continuance of life are totally and finally withdrawn. As a matter of individual human concern, the morality of euthanasia depends on one’s personal disposition as a rational and moral agent. There is nothing immoral when one believes that considering the possibility of a calm death is a realistic aspect of the principle of human flourishing. This basic principle which is the solid foundation of morality is generally all-encompassing since the beneficiary is not necessarily the person who has decided to undergo euthanasia. Human flourishing in this context applies to the loved ones–both close relatives and friends– of the patient who have given their own shares of sufferings while attending to the material, emotional and psychological needs of the latter who has been experiencing torment and excruciating affliction in a state of an incurable sickness. Simply put, euthanasia administered to the patient will, on one hand, make her/his “passing over” tranquil and serene and on the other, free the laboring loved ones from the anxiety and pressure that have interfered for a long period of time in their own gainful endeavors to make their own lives better and more liveable. This is the essence of human flourishing which is essentially intensified by the notions of (1) amelioration of suffering, (2) resolution of conflict, and (3) promotion of happiness. Having all these considered from my own personal orientation, there is absolutely not a single iota of theoretical postulation that morally contradicts the administration of euthanasia where such procedure has been deemed imperative on the basis of a patient’s voluntary resolve. Euthanasia is therefore moral from my perspective and does not transgress the generally accepted ethical codes or principles of my socio-cultural location. Ethics, as we have previously defined it, is characterized by certain rules of behavior, i.e., principles and codes of conduct established within an institutional framework. In this case, there is not an all-inclusive, across-the-board ethics of euthanasia since on one hand, there are groups that consider it wrong while on the other, there are those that are more flexible to declare that euthanasia is ethically correct. Religions in certain societies have their own different ways of looking at this phenomenon which could either be accepting or rejecting. Nevertheless, Christian religious denominations in varied hues and colors are generally of the opinion that euthanasia is wrong. Their fundamental premise is the proposition that all human life emanates from God and only God can take it away from its present possessor. No human being is therefore given the right to decide to terminate life whether it is hers/his or of another. With all these considerations in mind, the question, “Is euthanasia ethically correct?” does not lead us to a single unified answer. From the viewpoint of one group it is ethically correct while from that of another, it is absolutely wrong. As has been suggested previously, the more realistic ground whereon euthanasia may be handled more philosophically reasonably is in the area of morals where the question, “Is euthanasia morally correct?” is the better issue. Again, from my perspective, it is. ← Is There Really Freedom in a Democracy?